We are a group of educators with a passion for helping struggling students and their families. Our goal is to help our students learn to their potential, to transform struggling students into independent learners, and to foster a joy of reading in each of of our students. 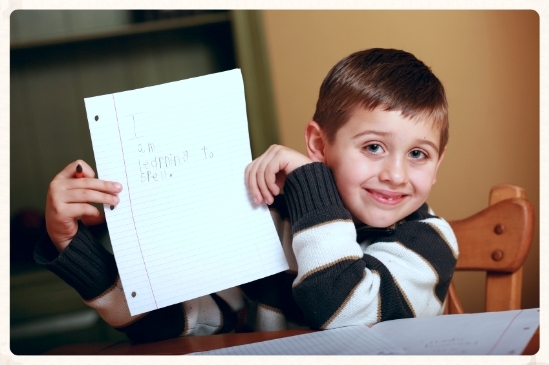 Read Texas instructors are experienced in working with students diagnosed with a wide range of learning challenges - including autism, dyslexia, add/adhd, and dysgraphia. We realize the importance of a positive and nurturing bond between student and instructor. We aim to keep sessions high-energy and as fun as possible while we work toward our goal of creating independent learners. Instructors are professional educators, classroom teachers, and graduate school students who all possess highly specialized training as well as a passion for working with struggling students. My early reading experience was much different that that of many of my students. Learning to read came easily and reading quickly became my favorite activity in elementary school. I often got in trouble for staying up past bedtime to read "just one more chapter". In 1997, I was a college student studying Journalism with little enthusiasm. At the urging of a professor who realized that journalism was not my passion, I applied for a summer tutoring job with a local learning center called Lindamood-Bell. During that interview the Director outlined their revolutionary programs and the ways in which they transformed their students' lives. It was a revelation to me at the time that not all children enjoyed reading as much as I had. That summer I worked for Lindamood-Bell as a Clinician and learned how to teach struggling students to read. By the end of the summer, I was hooked. Being part of a process that enabled students to make 2-3 YEARS worth of progress in 8-12 weeks was incredibly fulfilling. Students who were begging me to let them skip reading at the beginning of the summer were asking me for book recommendations by the end. For over a decade I worked for Lindamood-Bell Learning Processes as a Clinician, Consultant, Center Director, Workshop Presenter and finally as a Project Director in several public schools. My work took me all over the country allowing me to work with students of varying needs. This experience taught me a great lesson - that there is no typical student and there is never a cookie cutter solution. During these years I returned to college, abandoning my pursuit of a B.A in Journalism for a B.A in Educational Psychology. In 2008 I left Lindamood-Bell and returned to Texas to be closer to family. I started Read Texas Tutoring so that I could work directly with students again. Through my career with Lindamood-Bell and the different positions that I held, I learned that my definition of job satisfaction involves sitting next to a struggling reader who would rather do ANYTHING than read a book because he doesn't think he's smart enough to do so. My experience gives me the ability to see a few months into his future and know that if we work through enough of those sometimes emotionally exhausting tasks, that he will someday ask me, "what can we read next?" As my personal caseload reached capacity, I started bringing in other educators who were trained in the same or similar multisensory programs. We now work as a team sharing clients as our expertise and schedules dictate. Read Texas Tutoring began as a one-woman operation and has grown through word of mouth, which is something I am SO very proud of. There is no better compliment than one parent recommending our services to another. My promise to any potential client is that we will always treat your child as an individual with unique needs and requirements. While the programs that we follow may be the same programs that we use with other students, the way in which we implement these programs will be specific to your child's needs. I hope to speak with you soon to tell you more about our services and learn more about your child's unique needs. Please do not hesitate to contact me directly should you have any questions or need additional information. Read Texas Tutoring LLC is NOT Lindamood-Bell Learning Processes nor is it affiliated with, certified, endorsed, licensed, monitored or sponsored by Lindamood-Bell, Nanci Bell, Phyllis Lindamood or Pat Lindamood. Lindamood-Bell - an international organization creating and implementing unique instructional methods and programs for quality intervention to advance language and literacy skills - in no way endorses or monitors the services provided by Read Texas Tutoring LLC.